This is a self-help group at the moment as we are looking for someone to give us some of their experience to progress what we have started. We meet at noon on Fridays and bring a picnic lunch, buying a wine or other drink to help the funding of the room, and we chat whilst eating and setting up, then settle down to whatever project we are individually working on. We are beginners but love the peace to try out something new, and we are progressing well with perseverance and practice. If you would like to come along and try, bring a picture, photo or just an idea of something you would like to draw/paint, in any medium. And bring some paper, canvas, paints, pastels, whatever you like to use, and we all help each other to progress without feeling embarrassed to be a beginner. 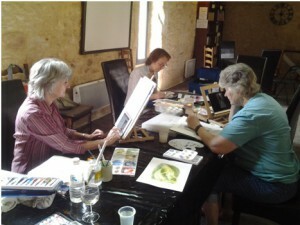 Of course more experienced artists would be more than welcome to give us some of their tips.